Study Master of Advanced Clinical Physiotherapy (Musculoskeletal) at the University of South Australia (UniSA). Information for International students. met the requirements for eligibility for registration as a physiotherapist or limited registration under supervision with the Australian Health Practitioner Registering Authority. Students must apply for limited registration after acceptance into the program. International students who are working with English as an additional language must have obtained one of the following standards within the last two years prior to admission. Note that only IELTS, OET, PTE Academic or TOEFL are accepted for entry to this program. No other equivalences apply. Possession of one or more of these standards, in addition to the academic entry requirements, does not, in itself, guarantee a place at the University of South Australia. Applications are considered on an individual basis and selection is competitive. Where previous study was conducted in English, the application must be accompanied by certified documentation from the educational institution certifying that the language of instruction was English. Benefit from flexible learning options that include a blend of on-campus and online study, with part-time study options available. Benefit from over 40 years’ experience in physiotherapy education. Learn from internationally-renowned teachers and clinicians. Advance your clinical skills through supervised practice in our on and off-campus physiotherapy clinics and placements. This Musculoskeletal Physiotherapy Australia accredited master degree is for qualified physiotherapists who want to gain advanced clinical skills and knowledge in musculoskeletal physiotherapy. You will develop advanced competencies in musculoskeletal physiotherapy through student-centred, critical, reflective engagement with contemporary theory and supervision by clinical experts in practical and clinical sessions. Graduates from our program work in clinical practice, advanced practice roles such as screening clinics and emergency departments, and academia. You will also receive supervision from postgraduate qualified physiotherapists to facilitate application of your new knowledge to clinical practice. 1. The program requires participation in practical classes where manual skills are practised. Essential learning activities in some classes may require that students partially remove their clothing to a level that is appropriate to the learning activity. Students may also be asked to act as subjects for their peer group members. If a student is unable to meet these requirements they may be at risk of being unable to successfully complete course objectives and assessments and progress through the program. 2. 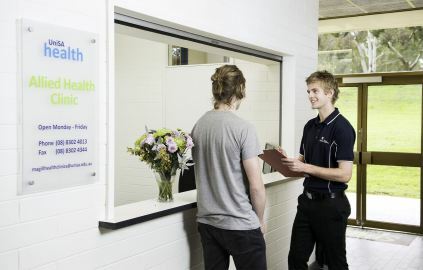 All students in the Division of Health Sciences who, as part of their program, undertake activities where interaction with patients/the public is required, such as in field or clinical placements/visits and in University clinics and gyms, must demonstrate that they have a current National Police Certificate (NPC) through SAPOL (or their home state police service) and a current Department for Communities and Social Inclusion (DCSI) Child-Related Clearance, which is valid for the duration of the program. The National Police Certificate will list disclosable court outcomes that may prevent clinical placement involvement. The University has a process for reviewing these outcomes to assess suitability for placement. 3. Before commencing any clinical courses, students are required to be registered to practice physiotherapy in Australia. International students are required to obtain a 'Limited Registration' under supervision from the Australia Health Practitioner Regulation Agency. 4. Students must hold a 'Provide First Aid' Certificate, including expired air resuscitation (EAR) and cardiopulmonary resuscitation (CPR), therapeutic oxygen techniques and automatic defibrillation training, asthma management and emergency trauma management certification before undertaking this course. The University will organise a combined workshop to cover all of these components, for which you receive national certification. 5. Students will be required to undertake Child Safe Environments training before commencing their clinical placement. 6. Students will be required to satisfy the standard of dress and behaviour prescribed by institutions in which the clinical placements are undertaken. Failure to satisfy such requirements may prevent them from satisfying the requirements for the completion of the program. 1. The program is normally completed in 12 months of full-time study or the part-time equivalent. 2. The Master of Advanced Clinical Physiotherapy does not itself qualify students for general registration as a physiotherapist in Australia. Physiotherapists trained overseas wanting to work in Australia must contact the Australian Health Practitioner Regulation Agency (AHPRA) for details on qualification acceptance and registration. 3. It is assumed that students enrolling into this course have obtained at least an undergraduate level understanding of the principles and practice of evidence-informed practice, and quantitative and qualitative research designs. UniSA has over 40 years' experience in physiotherapy education. If you want to advance your skills and knowledge in the area of musculoskeletal physiotherapy, then this may be the degree for you. You will learn from postgraduate qualified physiotherapists, with a curriculum informed by well above world-class research in Clinical Sciences1 and receive supervised outpatient practice to advance your musculoskeletal physiotherapy reasoning and clinical skills. We are fast becoming a renowned centre of innovation and enterprise in the sectors that will drive Australia's future, including health and biomedicine. It’s a very good time to choose UniSA for your postgraduate study. Our commitment to research with an industry focus is unprecedented in South Australia. In the 2015 Excellence in Research for Australia evaluation, 97 per cent of our assessed research was rated world-class or above. You will benefit from our strong industry links and have opportunities to build important industry networks as you meet influential invited speakers and receive supervised clinical education from expert musculoskeletal physiotherapists. Contemporary health care and clinical practice require therapists’ reasoning and practice to be critical, reflective, patient centred and evidence based. Postgraduate clinical education is the optimal way to develop the advanced clinical knowledge and skills essential to expert physiotherapy practice. The program is accredited by the Professional Standards Committee of the Australian Physiotherapy Association national group Musculoskeletal Physiotherapy Australia and satisfies the requirement for Titled Membership, Musculoskeletal Physiotherapy Australia. Employment for physiotherapists in Australia is projected to increase by 7,800 (31 per cent) by November 20201. Postgraduate clinical education is the optimal way to develop the advanced clinical knowledge and skills essential to expert clinical practice. Graduates have testified that their advanced knowledge and expertise has created new opportunities, enhanced their patient outcomes and increased their professional work satisfaction.